Our Top Five eco-friendly home improvement products. In honor of Earth Day this week, we’re thinking about sustainability. We can all help to create a greener Earth by understanding that while some things are out of our control, we all have control of our homes and the home improvements we choose to make. By simply researching and choosing home improvement products that are kind to the environment, you can make your home more eco-friendly. Here’s our Top Five list. Today’s hearth products have technologies built in to make them gentle on the environment while maintaining indoor air quality. Direct vent gas fireplaces, stoves and inserts prevent carbon monoxide and nitrogen dioxide from entering the home, are up to 85% efficient, and many models have intermittent pilot ignition to reduce energy consumption. EPA-certified wood- and pellet-burning stoves and inserts burn renewable fuels, are highly efficient heaters, and have low outside air particulate emissions. 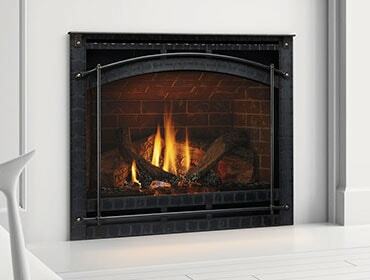 Electric fireplaces offer ambiance with no combustion byproducts. Check out the latest innovations here. Cork flooring is made from the bark of cork oak trees, which are incredibly fast growers. After a portion of bark is stripped from the tree for the flooring, the tree quickly regenerates and grows new bark in place of the removed bark. If you prefer carpet, hemp carpet is 100-percent biodegradable and natural. Made from durable hemp fiber, the carpet isn’t dyed with chemicals and the adhesive is made from natural rubber. Paints that contain VOCs (volatile organic compounds) have been linked to respiratory and related health issues. The federal government caps the VOC content in paint at 250 grams per liter (g/l) for flat finishes and 380 g/l for other finishes (low-luster, semigloss, etc.). Some manufacturers offer even lower levels of VOCs (like 50 g/l) with products likes Benjamin Moore Aura and True Value Easy Care. Paper-based countertops are a green alternative for countertops. Made from tree pulp harvested in carefully managed sustainable forests, paper-based countertops are a great alternative to stone and plastic surfaces. Recycled glass countertops are made from materials like beverage bottles, glasses and windshields. Fly ash (a coal production waste product) bonds the glass with concrete, instead of traditional method of using petroleum-based binders. An easy DIY project, low-flow showerheads, will help you conserve our most precious natural resource – water. Quality low-flow showerheads can be purchased for as little as $25 and can achieve water savings of 25 to 60 percent. Low-flow toilets got a bad rap when first introduced since they didn’t flush very well (that’s a problem), but today there are many models with much scoand getting closer to that of traditional single flush toilets. So, next time you’re embarking on a home improvement project, why not consider making your home more efficient, safe and sustainable? You’ll love how it makes you and your family feel.